BionicCobot is a pneumatic lightweight robot based on the anatomical construction of the human arm. Like its biological model, it can perform flexible and sensitive movements to solve a variety of tasks, such as grabbing something firmly, picking up something safely or tapping gently. 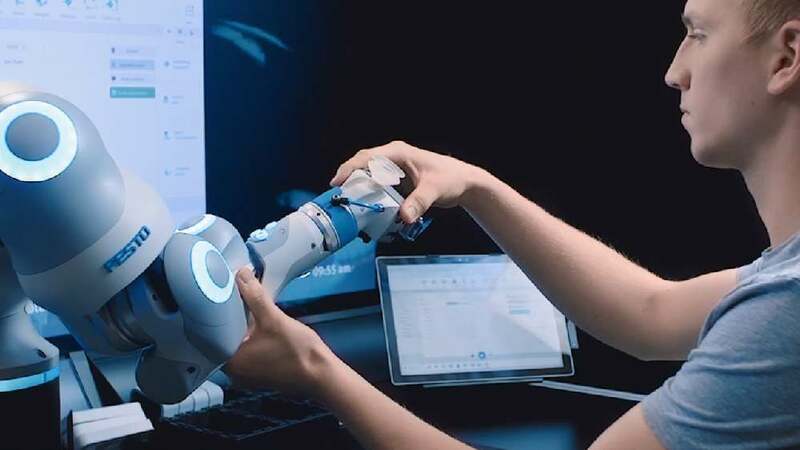 The BionicCobot is operated by means of a specially developed graphical user interface, designed to ensure a simple and intuitive operating concept. Via a tablet, users can easily teach the robot actions to be performed and set the parameters. Icons that speak for themselves in the upper area symbolise defined work steps and actions of the robot, such as opening and closing grippers. Moreover, these defined work steps can be arranged in a timeline sequentially and in any order using drag and drop. In doing so, the complete motion sequence is virtually depicted and simulated at the same time. Thus, users get visual feedback on the programming, enabling them to operate the robot in a clear and easy manner. Based on a smart concept, the design of this user interface succeeds in visually representing the operation of the highly complex robot arm BionicCobot in an intuitive and self-explanatory manner. The graphics and icons designed for this purpose are very clear. They offer convenient drag-and-drop programming and, at the same time, the option of visualising what has just been entered – an overall convincing, well-thought-out solution.